I’m not fussy when it comes to Rosehip oil. Any brand will do. Or did. Until now. Cos the unthinkable has happened. I’ve found a bottle of Rosehip oil I’m not too fond of. Moisturising: rosehips are loaded with fatty acids (like Linoleic, palmitic and oleic) that strengthen your skin’s barrier and help water stay in the skin. Anti-acne: acne sufferers have less linoleic acid in their sebum than people without acne. Adding it back in helps reduce the size of mini-comedones (mini pimples). Antiaging: rosehip is a natural source of vitamin A, an antioxidant that destroys free radicals, boosts collagen and speeds up cellular turnover (i.e., the skin’s natural exfoliating process). That’s 3 ways to keep wrinkles at bay! Brightening: vitamin A and linoleic acid help fade away sun spots and discolourations. If you’re looking for an anti-aging oil that goes the extra mile, rosehip oil IS it. I’m sure you know that vitamin E and rosemary are powerful antioxidants that help you prevent premature wrinkles. But I doubt that’s why they’re in Pai Rosehip BioRegenerate Oil. There are only a few drops of them here so don’t expect them to do too much for wrinkles. But that doesn’t make them useless. Here, they act as preservatives: they make the rosehip oil last longer than it would on its own. Pai Rosehip BioRegenerate Oil has a deep, earthy scent that’s a bit of an acquired taste. If you’re into your light florals, you probably won’t dig this. The plus side? The earthy scent’s a sign the oil is high quality. You know what else signals this oil is the real deal? The deep orangey colour. As a rule, the deeper the hue, the more antioxidants and goodies the oil contains. You’d think this’d be great news for my skin… but the deep orange hue is wy they don’t get along. You see, Pai Rosehip BioRegenerate Oil stains my skin yellow when I apply it. Ugh. Maybe I could have put up with that but… the thick texture takes a while to absorb. You guessed it, if I go to bed before it has fully sunk in, it stains my pillow too. I may be a skincare junkie… but I’m a lazy one at that. I don’t want to deal with stains, laundry and long absorption times. Sorry, Pai! If you don’t mind about these little drawbacks, the oil works wonders. I put it on before I go to sleep at night. When I wake up in the morning, my face looks plumper, feels smoother to the touch and is a little brighter. I can’t vouch for how well it treats acne or dark spots because I don’t have any (lucky, I know). Just be aware that Rosehip oil isn’t the miraculous treatment brands make it out to be. I’ve heard it said it can treat stretch marks, scars and who knows what else. There’s just no proof for that. What it does is moisturise skin, help reduce acne and – in the long run – keep wrinkles at bay. And that’s a lot, if you ask me. Pai Rosehip BioRegenerate Oil moisturises skin and gives it a lovely glow. In the long run, it can also help reduce acne and keep wrinkles at bay. But it takes a while to absorb and the deep orange stains skin. 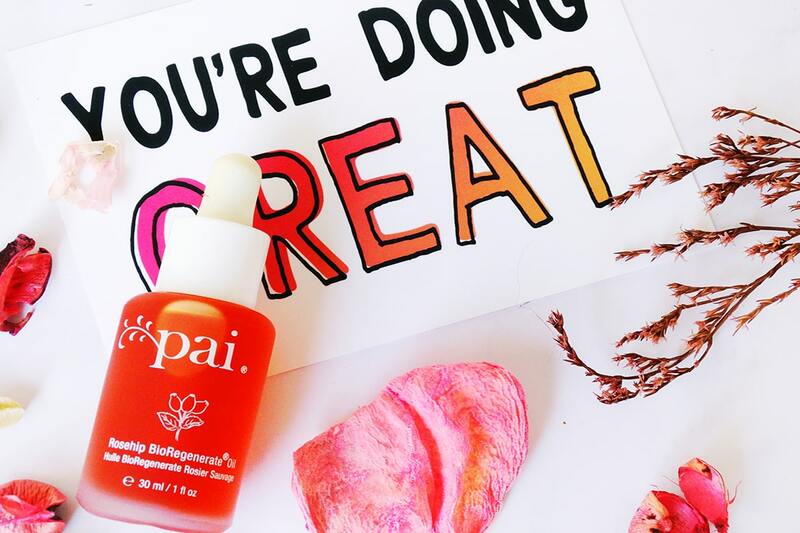 Have you tried Pai Rosehip BioRegenerate Oil? Share your experience in the comments below.